A woman was killed and three others injured when a logging truck rolled over into oncoming traffic and hit a car Sunday evening in Auburn, according to Mountain View Fire and Rescue. The incident occurred on Black Diamond Road. After the car was hit, it was thrown onto the guard rail, officials say. The woman died at the scene. A man and child were taken to Harborview Medical Center in Seattle, officials say. Their conditions are not known. The driver of the truck was also taken to the hospital. Both logging truck drivers and their employers can be held liable if a driver or company’s breach of the duty of due care caused an accident. The burden of proving negligence rests on the plaintiff, as does the responsibility of proving the damages that he or she sustained in the crash. A thorough investigation into the cause of a logging truck accident can be of great assistance should litigation ensue at some point in the future. 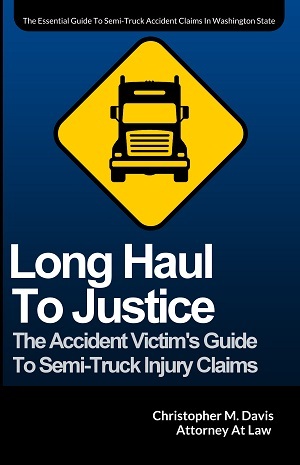 Unfortunately, evidence that could support the plaintiff’s case can quickly disappear if it is not properly preserved following the crash, and, for obvious reasons, representatives of the trucker’s insurance company are not likely to consider the plaintiff’s point of view when they investigate the accident. If you or a family member have suffered injury or death in an accident caused by a negligent logging truck operator, you have the right to seek compensation for your injuries in a court of law. An experienced Washington state truck accident attorney at Seattle-based Davis Law Group, P.S., can explain the litigation process to you in detail so that you understand both what you must prove in order to win your case and the damages to which you may be entitled if your lawsuit is successful. Just recently, attorney Chris Davis helped recover a $1 million settlement for a man that was severely injured by a logging truck in Port Angeles. The man suffered a cranial bleed, skull fracture, a traumatic brain injury with balance and memory issues, a tibial plateau fracture, as well as a loss of smell and taste. Mr. Davis held all at-fault parties involved responsible, securing the most compensation possible for the man and his family.